← How to deal with mortality in perinatal research: Part 1. When we consider prospective research, there are a couple of other issues to add into the conundrum. One is that, as many neonatal deaths follow a decision to limit the intensity of care, any intervention being studied risks affecting decision-making, and thus affecting mortality by an indirect route. This is most likely to be an issue in non-blinded trials, but could potentially be important in blinded trials also. For example the trials of therapeutic hypothermia were necessarily unblinded, but death in babies with severe HIE often follows a decision to redirect care. As everyone involved in the trials really hoped that therapeutic hypothermia would work, it is possible that decision-making for cooled babies could have been different to controls, leading to a change in mortality. I can’t find any evidence in the published reports that this actually happened, but it is difficult to be sure in the trial reports, as mode of death is not generally described. It is clear, on the other hand, that since the establishment of hypothermia as standard of care, decisions to withhold or withdraw life-sustaining interventions are occurring later, often after the cessation of hypothermia, and clinical management of these babies is more complex. As mode of death was not well reported, it is not clear if this might have happened in the trials as well. If it did, however, there were fewer surviving babies with major impairment in the trials, so it probably did not skew the results, or the importance of hypothermia as a therapy. For future research, in contrast, this could be important. The other big issue in prospective research is that patients who are deceased cannot contribute to longer term outcomes, such as retinopathy or BPD. How should we deal with this? We have traditionally created compound dichotomous outcomes such as : ‘death or disability’ or ‘death or BPD’. But death is truly a dichotomous outcome; impairment is not! According to a lot of prospective research, a Bayley II MDI of 69 is impaired, but 71 is not. Nor is lung injury dichotomous: Coming out of oxygen at 35 6/7 weeks is not BPD, but at 36 1/7 is? **UPDATE: after my talk Bob Truog from Boston talked about organ donation and death… his point was that death is not always a dichotomous outcome! One part of this conundrum is : what happens if the 2 parts of the composite outcome change in different directions? 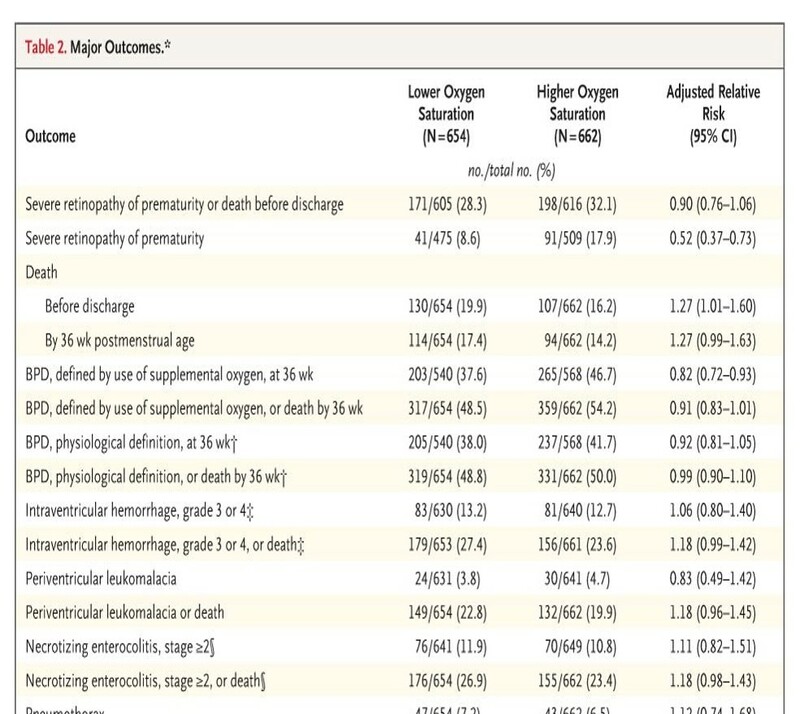 In the past this was a bit theoretical, as, in neonatology at least, occurrences of reduced death with an increase in other adverse outcomes have been very uncommon. More recently, SUPPORT (and the other oxygen trials) have to give us pause, as they showed increased death but decreased severe RoP. We should remember that in a strict sense, SUPPORT was actually a negative trial… there was no effect of the intervention on the primary outcome. Which is the top line in this table, the 2 lines that follow are the 2 different parts of that outcome. Another important issue is that the implication of ‘death or BPD’ is that they are equally important, or ‘death or ‘NDI’’. Even if that is not the intention of the investigators, the fact that a reduction in death may be ‘balanced’ by an increase in the other outcome, and therefore lead to a trial showing a difference in death being a negative trial (because the other part of the outcome changes in the opposite direction), implies that they are equally important. Also, dichotomizing other outcomes, (which are not themselves truly dichotomous) may miss important benefits. As one example the MoMs trial (of antenatal meningomyelocele closure) showed a substantial improvement in psychomotor developmental outcomes, p<0.03, but there was no difference in the proportion above and below their cutoff. Does this matter? One result of this trend, sing composite outcomes in research, is that we use them in antenatal counselling : the NICHD calculator, for example, can be used to predict “survival without severe disability”, and, even though it was not necessarily meant to be used for this purpose, many people use this calculation in their antenatal counselling. I wonder, seriously, is this appropriate? Do death, and survival with severe impairment, have the same implication for a family? I think I would like to know rather, how likely is it that I will die? And if I survive, how likely is it that I will have a colostomy? It would be even worse to be told, “the risk of surviving without “a colostomy, a wound infection, or losing my hair” was 50%”. This entry was posted in Neonatal Research and tagged Ethics, long term outcomes. Bookmark the permalink.